This paper aims to examine how the adoption decision of the internet banking in North Cyprus would be affected based on the following dimensions; the technology features, the personal characteristics, the social environment and the expected risk. A self-administered survey was conducted with 291 participants responded to it. The partial least square approach of the structural equation modeling (PLS-SEM) is employed to investigate the direct effects of the proposed factors on the adoption decision. Additionally, the mediation test is used to examine indirect effects. Results showed that even though the participants appreciated the benefits of the online banking as the perceived usefulness factor exerts the greatest direct effect, they would rather use clear and easy-to-use websites, adding to that their assessments of the usefulness of these services are significantly influenced by the surrounding people’s views and prior experience. This is demonstrated by the total effects of the perceived ease of use and the subjective norm factors, which are greater than the direct effect of the perceived usefulness factor since both of these factors have significant direct and indirect effects mediated by the perceived usefulness factor. The negative impact of the perceived risk factor is weak compared to the previous factors. While the personal innovativeness factor showed the weakest effect among the proposed factors. The recent substantial developments in technologies and innovations have stimulated the community and businesses to adopt the latest technology because of its countless advantages that have eased and improved the business environment in the recent decades. This has drawn the attention of the researchers to investigate for models which determine the main factors that can encourage people to adopt these technologies. The technology acceptance model (TAM) known as a parsimonious model comprises the main technology’s features that would encourage users to adopt it, furthermore, the verifiability of TAM has been confirmed by researchers, and the generalization of its findings has been established as well, since the technology acceptance model has been used to examine the adoption of different types of the information technology with a heterogeneous group of subjects through many points of time. (Chintalapati and Daruri, 2017). TAM has been widely addressed in literature particularly related to the internet banking services, taking into account that the internet banking has created a competitive environment for banks in the market and enabled them to reach and serve a broader range of customers with less cost. The internet banking has enhanced the transparency of the banks’ financial statements disclosure and it gives banks an easy tool to market its services (Nasri and Charfeddine, 2012). Considering the significance of the internet banking services in the current scenerio, this paper contributes to the better understand about the internet banking adoption decision by extending it to the technology acceptance model (TAM). Furthermore, technology acceptance model will be integrated it into a new model that consists of the main four influential dimensions that have been proposed singly or bilaterally in the previous literature. The key influential dimensions that will be addressed in this study are the technology features dimension, the personality dimension, the social dimension, and the uncertainty about the usage consequences (i.e. the expected risks). This study is undertaken in North Cyprus which recently becomes a destination for many international students, real estate investors and tourists, what causes a remarkable advance in its the banking sector in corresponding to the increased demand for banking services by newcomers. In general the economy of North Cyprus depends on the service sector that includes education and tourism, and according to a recent study on customer satisfaction and loyalty in banking sector in North Cyprus showed that the vast majority of the TRNC citizens who have participated in this study prefer visiting bank branches, due to security issues and friendly service provided by the banks’ personnel. Furthermore, the quiet lifestyle in this small part of the island, which is free of congestion, and the accessibility of all facilities within a short time, in addition to the socializing nature of the TRNC people who they live in a cohesive society in which the personal relationships is highly valued, These special characteristics have reflected on the banks’ working environment, as most customers prefer visiting the bank branch in their neighbourhood and establishing good relations with the bank personnel rather than using the alternative banking channels (Ozatac, et al., 2016). This highlights the importance of this paper that aims to provide important insights about the potential customers and helps the banks’ managers in North Cyprus in enhancing their marketing strategy and benefiting from internet banking advantages. Furthermore, the diverse community in North Cyprus which has come from different countries stimulates the banking system competitivity with many improved services and facilitates its integration with the global financial system. Moreover, to the best of our knowledge, this paper is the first in the literature that investigates the extension of the technology acceptance model (TAM) in North Cyprus. Additionally, this study also analyzed four influential dimensions in one model that have not been utilized together in one model before in the earlier literature in these regards. Additionally, the proposed model in this paper is a mixed model that distinguishes between reflective and formative constructs, since the subjective norms (SN) construct that represents the social dimension is measured by formative indicators as it is a result of interpersonal communication process and it is formed by the external influences (Rogers, 2003). The other constructs (i.e. PU, PEOU, INO, R and IN) are measured by reflective indicators. Two approaches have been followed in the adoption literature, in the first approach technology’s features are the main factor in the adoption decisions, while the second highlights the functional and psychological aspects that influence the adoption decision (Yousafzai, 2012). In the internet banking literature, the technology acceptance model (TAM) has widely represented the first approach, with TAM main elements the perceived ease of use (PEOU) and the perceived usefulness (PU) researchers could capture the internet banking services features Giovanis, et al. (2012); Kalaiarasi and Srividya (2012); Al-Fahim (2012); Yoon and Steege (2013); Wu et al. (2014); Kumar and Govindaluri (2014); Bashir and Madhavaiah (2015); Rawashdeh (2015). However, few studies have indirectly indicated to these factors and substituted them by other factors such as the Importance of Internet Banking needs, compatibility, and convenience factors in (Oruç and Tatar, 2016), while Kesharwani and Radhakrishna (2013) addressed the perceived benefit and the services compatibility factors, and Jalil et al. (2014) addressed the website characteristics factor. In this paper, the perceived ease of use (PEOU) and the perceived usefulness (PU) will represent the technology features dimension. The researchers in the second approach have examined the effect of the personal dimension on the internet banking adoption, Kumar and Madhumohan (2014) addressed the Awareness factor and the computer self-efficacy factor which is addressed by Kesharwani and Radhakrishna (2013), while Yoon and Steege (2013) addressed the personal openness for any new experience factor. In this study, the Personal innovativeness factor will be addressed in order to investigate the effect of the personal dimension on the internet banking adoption decision. Along with the personal dimension, the social pressures has received a special attention by researchers in order investigate its influence on the individual compliance to use internet banking services Bashir and Madhavaiah (2015); Kumar and Madhumohan Govindaluri, (2014); Kesharwani and Radhakrishna (2013). In their turn, Yoon & Steege (2013) proposed the green concern factor as a representative of the social pressure, while Wu et al. (2014) referred to the social influence in the form of subjective norm factor, which it will be addressed in the current paper as well. Last but not least, the expected trisks factor has represented the reluctant attitude to adopt the internet banking services due to the uncertainty of usage consequences. In general, the perceived risk has been addressed as a whole one factor, however, some researcher have decomposed it into several types such like performance risk, social risk, time risk, financial risk and security risk Fadare et al. (2016); Giovanis, et al. (2012). On the other hand, some researchers have only addressed few types of risk Yoon and Steege (2013); Jalil et al. (2014) addressed the security concerns factor, Awni Rawashdeh (2015) addressed the privacy risk, while Kesharwani & Radhakrishna (2013) addressed the performance risk, hacking, and fraud. In this study, the perceived risk factor as a whole one factor will represent the uncertainty of usage consequences dimension. The following table summarizes the previous studies focusing on the proposed factors, the study subjects, and its place, in addition to the analytical methods that have been employed to obtain the study findings. Perceived usefulness, perceived ease of use, perceived risk (decomposed), the compatibility of the service. Perceived usefulness, perceived ease of use, perceived risk. The perceived benefit, performance risk, hacking, fraud, computer self-efficacy, services compatibility, social influence, pricing concerns. Perceived usefulness, perceived ease of use, openness, green concerns(SN), and security concerns. Perceived usefulness, perceived ease of use, perceived risk, perceived behavioural control, the subjective norm. Perceived usefulness, perceived ease of use, perceived risk, social effect, trust, enjoyment, user-friendly website. Performance risk, social risk, time risk, financial risk and security risk. Importance of Internet Banking Needs, Compatibility, Convenience, and Communication. 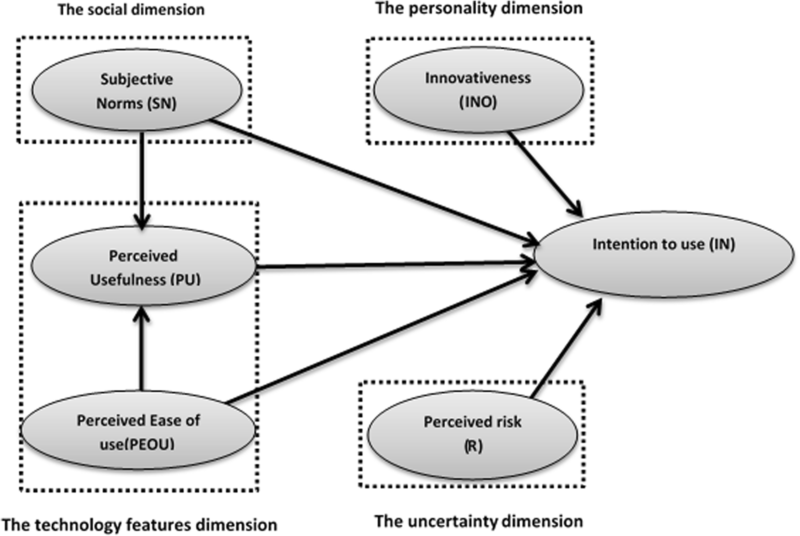 Figure 1 illustrates the conceptual framework of this study demonstrating that the intention to use internet banking would be affected based on the following dimensions: the technology features dimension represented by the technology acceptance model (TAM) with its two elements the perceived usefulness (PU) and the perceived ease of use (PEOU), the personality dimension represented by the personal innovativeness factor (INO), the social dimension represented by the subjective norm (SN) factor, and the uncertainty about the usage consequences dimension represented by the expected risk factor (R). The perceived usefulness factor refers to the users’ beliefs that adopting internet services would help them improving their productivity and their performance efficiency as well. Thus If they believe that they would benefit from using internet banking, the more likely it would positively affect their intentions to use it (Chuttur, M. Y., 2009). Hypothesis one: The perceived usefulness factor is positively associated with the customers’ intention to adopt the internet banking services. The perceived ease of use factor refers to the users’ perspectives and their evaluations of the internet banking usage difficulty, that would affect their intention to adopt such services, so as far as these services are easy to use and do not cause any confusion, it could encourage customer to adopt these type of services (Chuttur, M. Y., 2009). Hypothesis two: The perceived ease of use factor is positively associated with the customers’ intention to adopt the internet banking services. The perceived ease of use factor would also indirectly influence the students’ intention to use internet banking services, considering that students would value the beneficial outcomes from using the internet banking if it is easy to handle and does not require much effort to use it (Chuttur, M. Y., 2009). Hypothesis three: The perceived ease of use factor indirectly influences the customers’ intention to use internet banking through the perceived usefulness factor. The subjective norm factor refers to the social environment effects on the customers’ intentions to use internet banking, since the surrounding people’s beliefs and thoughts about this type of services would motivate the customer to use it, as well it could influence the customers’ perspectives about how it would be useful if they used these services (Willis, T. J., 2008). Hypothesis four: The subjective norm factor is positively associated with the customers’ intention to adopt the internet banking services. Hypothesis five: The subjective norm factor indirectly influences the customers’ intention to use internet banking through the perceived usefulness factor. The perceived risk refers to the uncertainty degree that relates to the unfavorable consequences of using the internet banking, the most concerned issues that could negatively influence the customers’ decisions to adopt internet banking services are; the security and privacy issues and the potential financial losses and the ability to correct the occurring mistakes (Kesharwani, A., & Singh Bisht, S., 2012). Hypothesis six: The perceived risk factor is negatively associated with the customers’ intention to adopt the internet banking services. The personal innovativeness factor refers to the individual’s readiness to experience a new innovation, according to the personal innovativeness the individuals in one society can be classified into five categories the innovators and the early adopters individuals,these two categories are the Pioneers in adopting any new innovation, then they are followed by those individuals in the early majority and late majority categories, while the individuals in the laggards category are the latest adopters (Rogers, E.M., 2003). Hypothesis seven: The personal innovativeness factor is positively associated with the customers’ intention to adopt the internet banking services. 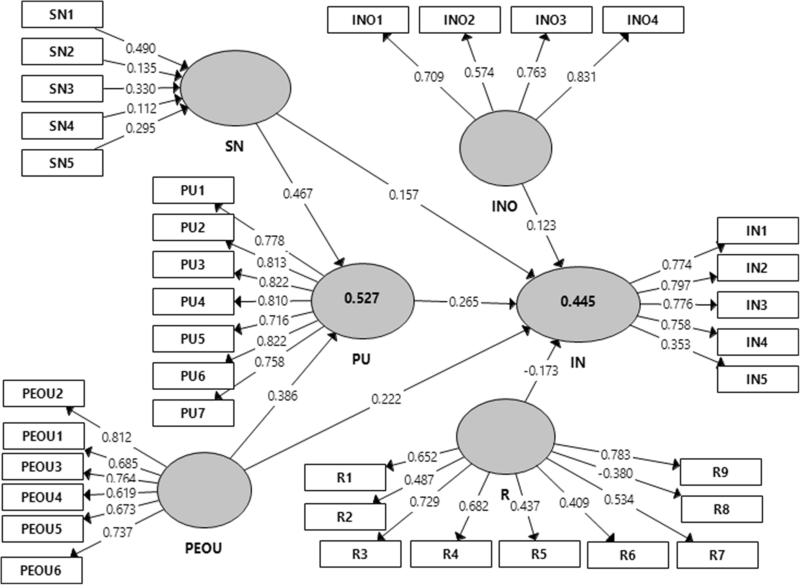 To ensure the sample size adequacy and since this research is employing the partial least square approach of the structural equation modeling, the minimum sample size requirement is determined based on the paths number, i.e. the number of arrows that point to the latent variable constructs, this rule is proposed by Marcoulides and Saunders (2006), who they have recommended 80 cases as a minimum sample size in corresponding to 7 arrows. Although the partial least square approach has the ability to handle small sample sizes, researchers have suggested that sample size between 100 and 300 would be preferred when a path modeling is carrying out (Wong, 2013). Sekaran (2003) have shown that conducting a survey would be useful to describe the characteristics of a large population. In this regards, 300 questionnaires were distributed randomly among the international students in North Cyprus. A total of 291 completed questionnaires have been received back to be addressed in the study sample. Appendix illustrates the questionnaire form. 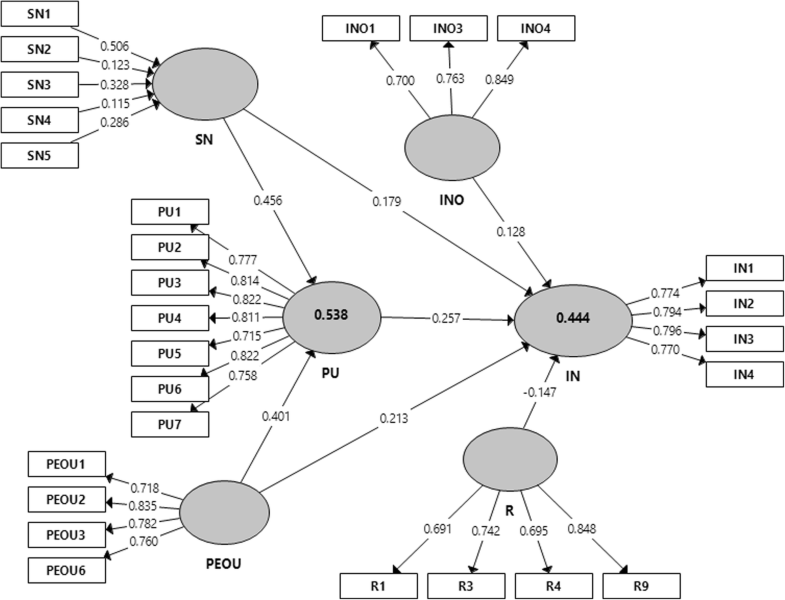 Recently the partial least square approach of structural equation modeling has become one of the most popular multivariate analytical methods, due to its capability to deal with the non-normal data distributions which are the case in the social sciences data, in addition to its relatively small sample size requirements and high flexibility to deal with formative indicators (Hair, 2014). PLS-SEM has been used in wide variety of the social sciences studies recently, such as marketing research, management information systems, operations, strategic management and accounting. (Monecke and Leisch, 2012). Moreover, PLS-SEM has been developed to deal with the data inadequacy issues such like heterogeneity. Also, it has provided the researcher with suitable means to conduct a simultaneous test for multiple relationships among the variables in the case of complex and multivariate phenomena (Hair et al., 2014). Based on that employing the Partial Least Square Approach for the Structural Equation modeling (PLS-SEM) would be more suitable to achieve the study objectives. Mainly in this study, the researcher has used the well-known Statistical Package for Social Science software (SPSS) v.20 and SmartPLS (version.3.2.4) software tools for partial least square Structural Equation modeling (PLS-SEM) (Ringle et al., 2015). The initial tests have been conducted based on (31) reflective indicators and 5 formative indicators using SmartPLS software, the program has been set to 300 maximum iterations with stop criterion of 7. Figure 2 shows the initial test results demonstrating that 9 of reflective indicators have relatively low loadings with their corresponding construct. The initial test has shown that removing (9) reflective indicators would improve the quality and the predictive relevance of the structural model, and achieve noticeable improvements in the internal consistency, convergent validity and discriminant validity of the reflective measurement constructs. Consequently, the researcher has removed the following indicators one at a time R8, R6, R5, R2, R7, IN5, INO2, PEOU4, and PEUO5. Figure 3 illustrates the structural equation model for this study after conducting the required modification. Table 1 shows that indicator reliability values are ranged between (0.477–0.720) so it can be concluded that the indicator reliability is confirmed by Hulland and Richard (1999). The composite reliability value will be addressed to examine the internal consistency for the reflective constructs, Table 2 shows the composite reliability for each construct is greater than 0.7 confirming the Internal consistency reliability (Hair et al., 2014). The average variance extracted (AVE) value for each construct is greater than the acceptable threshold of 0.5, so it can be concluded that the convergent validity is confirmed by (Henseler et al., 2016) (Table 3). Table 4 demonstrates that the loadings of the construct’s indicators exceed cross-loadings giving a discriminate evidence among the constructs (Voorhees et al., 2016). Table 5 illustrates that the square root value of the AVE of each construct is greater than its correlation values with other constructs, confirming the discriminant validity according to Fornell and Larcker Criterion (Henseler et al., 2016). The discriminant validity between two reflective constructs will be confirmed if the HTMT value is less than 0.90. Table 6 shows that the HTMT values have not exceeded the 0.9 thresholds so it can be concluded the discriminant validity has been established among all constructs. (Henseler et al., 2015). Table 7 demonstrates the bootstrapping1 results of the outer weights of the formative construct (SN) (i.e. Paths coefficients significance tests) (Ringle et al. (2015)). Since the outer weights of two indicators are not significant, in this case, the significance test of the outer loadings (i.e. the bivariate correlations of the formative indicators with its construct) should be conducted, Table 8 demonstrates the bootstrapping results of the outer loadings, revealing the suitability and relevance of the formative measurement model (Hair et al. 2014). The redundancy analysis will be carried out to confirm the convergent validity of the formative measurement model, Fig. 4 demonstrates the redundancy analysis results and shows that the path coefficient between the formative construct (SN) and the global item (i.e. the mean of the formative indicators) is (1) greater than the threshold 0.8 so it can be concluded that the convergent validity is established as in Hair et al. (2014). Table 9 demonstrates the VIF value for the formative indicators and shows that VIF values are lower than threshold 5 confirming the absence of the multicollinearity problem (Hair et al., 2014) (Table 9). It is essential to conduct a test for the common methods of bias as both of endogenous and exogenous variables are collected togather using one questionair (Lowry and Gaskin, 2014). For the reflective constructs, Harman’s single factor test will be used, Table 10 shows that the merged single factor explains 33.655% of the total variances in the model, this is less than the threshold 50%, so it can be confirmed the absence of the common methods bias in the reflective indicators (Lowry and Gaskin, 2014). For the formative construct, Pearson’s correlations matrix will be used to examine the correlation values between the formative indicators, Table 11 shows that there is no correlation value exceed 0.09 threshold, so it can be confirmed that there is no Common Methods Bias in the formative indicators (Lowry and Gaskin, 2014). Table 12 illustrates the indirect effects of Perceived ease of use (PEOU) and Subjective Norm (SN) on the endogenous construct Intention to use (IN), these effects are mediated through the Perceived Usefulness (PU) factor. Table 13 illustrates the total effects of the proposed factors (i.e. the sum of the direct and indirect effects). The bootstrapping results in Table 14 shows that both of the direct and indirect effects of PEOU and SN on the endogenous construct Intention to use (IN) are statistically significant, revealing that the Perceived Usefulness (PU) partially mediates the effects of PEOU and SN (Nitzl et al., 2016). The Variance Inflation Factor (VIF) values of the exogenous latent variables in the Table 15 are lower than the threshold (5), based on that it can be concluded there is no multicollinearity problem within the structural model. (Lowry and Gaskin, 2014); Ringle et al., 2015). The standardized root mean square residual SRMR criteria is used to ensure the absence of misspecification in the mixed model that consists of reflective and formative constructs, SRMR assesses the differences between the actual correlation matrix (observed from the sample) and the expected one (which is predicted by the model). SRMR value is equal to 0.059, which is less than the threshold of 0.08 indicates a good fit of the model (Henseler et al., 2016). The five exogenous variables (INO, PEOU, PU, R, and SN) moderately explain 44.4% of the total variance in IN. Also, PEOU and SN moderately explain 53.8% of the total variance in PU. Table 16 shows small difference s between R2 and adjusted R2 values. The elimination effect size of each exogenous variable on the model explanatory power is calculated in Table 17, results reveal that dropping any of the exogenous variables (INO, PEOU, PU, R, or SN) that explain (IN) has a medium effect size on its R2, since the f2 cutoff values for small effect size is (0.02, 0.15) for medium effect size, and (0.3) for high effect size. While the elimination of either PEOU or SN and has high effect size for each of them on the R2 for (PU) (Garson, 2016). The blindfolding2 technique will be used in order to obtain the cross-validated redundancy values (i.e. the Stone Geisser Q2 for the endogenous reflective constructs PU, IN) (Ringle et al., 2015). Table 18 shows the Cross-validated redundancy (Q2) values for IN and PU. Since the Q2 values for IN and PU are 0.260 and 0.329 respectively, which is greater than 0 it can be concluded the structural model has good predictive relevance with regard to the endogenous constructs IN and PU. Garson (2016). The following Table 19 summarizes the hypotheses test results. This study reveals that perceived usefulness (PU) factor plays an important role in influencing the internet banking adoption decision, inline with the previous literature Al-Fahim (2012); Kesharwani and Radhakrishna (2013); Kumar and Madhumohan (2014); Bashir and Madhavaiah (2015); Rawashdeh (2015). Since PU exerts the greatest direct effects compared to the other factors and partially mediates the indirect effect of the perceived ease of use (PEOU) and the subjective norm (SN) factors. The results of the study showed that path coefficients in PLS-SEM are standardized regression coefficients, which enables the comparison between the magnitudes of the exogenous variables effects (Jakobowicz (2006)). By comparing the total effects of the proposed factors illustrates it has been quite evident that the perceived ease of use (PEOU) factor exerts the greatest effect (+ 0.316), followed by the subjective norm (SN) factor (+ 0.296), then the perceived usefulness (PU) factor (+ 0.257), followed by the perceived risk (R) factor with negative total effect (− 0.147), while the personal innovativeness (INO) factor exerts the weakest effect (+ 0.128). These findings of our study are in concordance with the studies of Giovanis, et al. (2012); Kalaiarasi and Srividya (2012); Wu M, et al. (2014); Bashir and Madhavaiah (2015); Fadare et al. (2016); Oruç and Tatar (2016) who have investigate the previos factors’ effects, but in contrast to Yoon and Steege (2013); Kesharwani and Radhakrishna (2013), who they have shown that the social influance has insignificant effect on the intention to adopt the internet banking services. It is further noted that the subjective norm (SN) factor (SN - > PU = 0.456) exerts a greater effect on the perceived usefulness compared to the perceived ease of use (PEOU) factor (PEOU - > PU = 0.401). The previous results showed that even though the participants appreciate the benefits of the online banking they would rather use clear and easy-to-use websites, adding to that their assessments of the usefulness of these services are significantly influenced by the surrounding people’s views and prior experience. The reluctant effect of the perceived risk factor (R) appears to be lower than the positive effects of the perceived usefulness, perceived ease of use (PEOU)and the subjective norm (SN), which means participants tend to weigh more the expected advantages, the convenience of this services, and the surrounding people’s opinions. The personal innovativeness (INO) factor seems to have the least exerts among the proposed factors. Based on the above results it is suggested that continuous efforts should be made by bank managers to improve the usability of their website. The manager may ensure that customers are provided with a clear user-friendly guide. Developing an effective advertising campaign has appealing content with offers or services that would create value for clients and increase the awareness about such services. These actions can increase the perceived usefulness of the internet banking service and persuade the customer to adopt this type of services. Furthermore, the proposed model in this study can explain about 44.4% of the variances of the internet banking adoption decision in North Cyprus. This specifies the need for other factors to be included in the prospect studies. In this connection, the following factors need to be addressed in the forthcoming studies; the customer satisfaction with the conventional services, the awareness about the electronic commerce regulations. It is used in the case of non-normal data, bootstrapping technique can be summarized as a resampling method, by which numbers of subsamples are generated through a random dropping and replacing sets of observations from the original data in order to derive the entire distributions and enable the significance tests (Ringle, C. M. et al., 2015). an iterative process starts with determining an omission distance which is usually recommended to be 7 observations, that means the blindfolding process will be repeated 7 times. This technique can be described as follow: starting from the first data in the targeted construct’s indicators, each seventh point will be droped and replaced with the indicator’s mean value until the end of the observations, then the PLS algorithm will be run to estimate the path coefficient, the obtained estimatations will be used to predict the dropped data points, later a comparison between the predicted values with the original observations (the dropped data points) will be conducted to calculate the differences and use it as inputs of Q2 (i.e. Sum of squares of observations SSO and Sum of squared prediction errors SSE (Ringle et al., 2015); Tenenhaus, 2005). We are thankful to the Editor and the anonymous referees for their most valuable suggestions that improved early version of the manuscript. The datasets on which the conclusions of the manuscript rely on are available upon request. HA proposed the subject. HA together with FF performed the necessary computations and statistical analysis and then highlight the results. Both the authors read and approved the final version of the manuscript. If I heard about a new IT I would look for a way to experience it. Among my peers, I am usually the first to try out new information technology. I like to experiment with new information technology. In general, I’m interested in keeping up with the latest inventions. Using internet banking gives me a greater control over my financial issues. Using internet banking provides me with convenient access to my accounts. Using internet banking saves my time and enables me to do my banking activity quickly. Using internet banking saves my time and that reflects on my productivity to do my study tasks. Using internet banking enables me to utilize the bank’s services efficiently. Internet banking services are compatible with my life style. In general, I find internet banking is useful for me. People whose opinions I value think that internet banking is useful. I most likely tend to benefits from the others’ experience and their advice. The others’ opinions motivate me to use internet banking. I feel comfortable while using internet banking services. Using internet banking services is easy for me. I find all internet banking contents understandable. I can use internet banking services without asking for help. I think the easy use of the internet banking services makes it more useful. Internet banking services may not perform very well and cause problems with my credit. Internet banking server may not perform well and thus process payment incorrectly. There is a chance to lose money if I use internet banking services. Using internet banking to pay my bills may cause a sort of financial losses or problems. I am worried that third parties would steal my username and password. I think that the password generating and distributing process is well secured. I intend to begin/continue using Internet banking in the future. I will recommend others to use Internet banking. I think that I will not use/continue using Internet banking in the future.